Home Education Kentucky African American Encyclopedia given to school libraries, in partnership with Campbellsville U.
Kentucky African American Encyclopedia given to school libraries, in partnership with Campbellsville U. 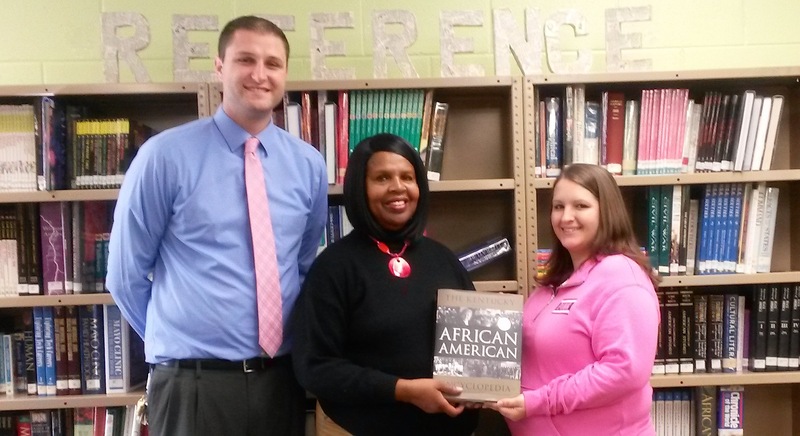 Greater Campbellsville United (GCU), the organization serving Adair, Green and Taylor counties dedicated to equality and opportunity, presented copies of the new Kentucky African American Encyclopedia to the libraries in each county. The new resource, released this year by University Press, includes the stories of hundreds of African American Kentuckians with the unique and important contributions of each. Wanda Washington, Executive Director of GCU, said she is pleased to have been able to present the comprehensive book to all the libraries in the tri-county area as part of the GCU partnership with Campbellsville University’s Dialogue on Race. The new book is now available at each of the following: Campbellsville University Library, Lindsey Wilson College Library, Taylor County Public Library, Campbellsville High School Library, Taylor County High School Library, Green County High School Library, Green County Public Library, Adair County High School Library and the Adair County Public Library. Dialogue on Race began in 1999 in Taylor County and has expanded its service to Green and Adair. Dr. Gerald Smith, distinguished professor at the University of Kentucky and recent recipient of Campbellsville University’s Racial Reconciliation Award, served as an editor of the publication and worked with numerous other writers in compiling and collecting the essays in the book. GCU believes this is a resource that will benefit the offerings by each of the libraries of our region and will provide a valuable source of historical information in the future. See this NKyTribune story about University Press of Kentucky books.